The heart of luxury has always been the best service. This simple truth consists in the practice of anticipating a guest’s requirements, understanding them with a genuine concern for their happiness and pleasure. A5-star hotel in Bangkok pays an attention to detail that makes every guest feel like the most important person in the property. These are the qualities we expect from a luxury Bangkok boutique hotel, and the qualities our guests deserve at VIE Hotel Bangkok, MGallery Hotel Collection. Here, you will not only enjoy an ideal location for leisure but also a full complement of a specialisation in comfort. Conveniently located just a few steps from the BTS Skytrain Ratchathewi station, award-winning VIE Hotel Bangkok is a designer creation of renowned French architect J.H. Boiffils. Feel the spellbinding atmosphere of intriguing Asian accents complete with works of art, exotic furniture, soft shades and audacious colours. 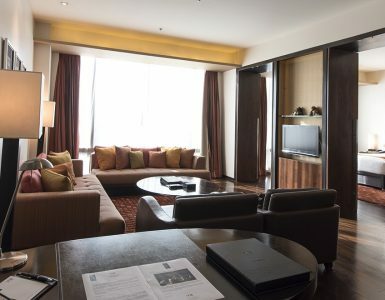 This 5-star hotel in Bangkok offers 154 duplexes, spacious rooms and suites, with high ceilings and floor-to-ceiling windows that provide dramatic views across Bangkok’s inspiring cityscape. Discerning guests will fall in love with each room’s large, comfortable bed and a luxurious pillow menu to suit your preferences and crisp cotton sheets for peaceful nights, and your 24-hour butler is on hand to fulfill your every need. Dining options at this 5-star hotel in Bangkok are splendid. La VIE – Creative French Cuisine restaurant offers fine dining and a romantic atmosphere, as well as frequently visiting Michelin-star chefs. YTSB – Yellow Tail Sushi Bar is the paradigm of superb Japanese culinary arts, with exquisitely prepared portions of extremely fresh sushi, and delicious and authentic cuisine. This 5-star hotel in Bangkok is perfectly suited to a luxurious lifestyle, with a variety of pleasures. A session at VIE Spa offers signature treatments that will plunge you deep into bliss, while the chic VIE Lounge is also perfect for winding down a few hours in relaxation with a small gathering or intimate meeting. Guests find that the premium facilities of We signature fitness club make it well worth a visit, and the stylish rooftop VIE pool with its unique infinity design and completely transparent walls surrounding it offers intriguing views of one of the world’s most exciting cities.